The sun rises over the Bay of Bengal, as seen from the Marina beach. May the New Year bring a lot of light, cheer, joy and prosperity to everyone, everywhere - have a great 2010, folks! One of the occupational hazards of being a 'dubash' (from 'dvi' = 'two' and 'basha' = 'language') with the East India Company was having your name twisted around and being anglicized beyond local recognition. Resilient people they were, the dubashes took it all in their stride, comfortably straddling two worlds separated not just by language, but also by customs and cultures. One such dubash was Alangatha Pillai, who was prominent enough to be one of the first 12 aldermen of the Corporation of Madras - he was named in the Charter itself. Apart from being a dubash, Alangatha Pillai, or Allingall as he was referred to by the British, was also the chief merchant of the British East India Company in Madras, coming to that position in 1680. Even in the days before he became the chief merchant, Alangatha Pillai had built up a good deal of coin with his dubash skills. Like many good folk, Alangatha Pillai deployed some of his earnings to religion. While he was likely generous in his donations to several temples, it is believed that Alangatha Pillai was specially fond of Ekambareswarar, the deity at Kanchipuram. He was a regular visitor to that shrine until the governor (was it Streynsham Master?) put it to him that if he were to build a temple near the Fort, a great deal of travel could be avoided*. Putting that idea to work, Alangatha Pillai had the Ekambareswarar temple built on what was then the Washers' Street. However, there are other versions which claim that the temple has been in existence for over 500 years now, dating it to a time before the British. In which case, Alangatha Pillai probably financed the temple's renovation, endowing it richly from his personal fortune. Because of his munificence, the temple was marked in the official records as "Allingall's Pagoda"; that name did not catch on and the temple continues to be known as 'Chennai Arulmigu Ekambareswarar Temple'. There is, just as soon as one steps inside the temple, this carving on one of the pillars, showing a devotee. It is believed this represents Alangatha Pillai, the chief devotee at one time! * A similar story is said about the Varadaraja Perumal temple at Kaladipet, but that'll have to wait for another post! That's a Rajdoot Yamaha RX-100, if I'm right. An old model - this bike is probably being overhauled ('overoiled') to be as good as almost-new! The calm of this stately gateway is a stark contrast to the bustle at the neighbouring Zam Bazar. There was a time when shehnai artistes would sit in the shade of the gateway, their music lifting the spirits of evening shoppers. Those days are long gone, but music still remains a passion for the residents inside this complex, the Amir Mahal. At their head is the current Amir-e-Arcot, HH Mohammad Abdul Ali, who is the eighth Prince of Arcot. The first Prince, HH Azim Jah Bahadur, was granted the title in 1868 by Queen Victoria. That was to compensate, in some measure, for the vast properties seized by the British after the last Nawab of Carnatic, Ghulam Muhammad Ghouse Khan, died heirless in 1855. Out of the chaos surrounding the British governement enforcing the 'Doctrine of Lapse', Ghulam Muhammad Ghouse's uncle, who had served as his regent, was created the first Prince of Arcot. Part of that deal was that the family would move from Khalsa (or was it Kalas?) Mahal, where the Nawab's family continued to stay even after it had been taken over in 1859. Amir Mahal was over 70 years old even at that time and needed a fair amount of renovation. The Royapettah Police Court, which was then functioning in the premises was moved out, and several repairs and modifications made to the buildings before the formal investiture of the title "Prince of Arcot" was made on April 12, 1871. The first Prince, though, never lived at the Amir Mahal - he requested that he be allowed to continue living at Shadi Mahal and so the first occupant was Sir Zahir ud-Daula, who succeeded to the title after his father's death in 1874! In 1834, Thomas Babington Macaulay set off from Falmouth, and reached Madras on June 10 that year. Writing to his sister Margaret*, he says: "I do not know whether you ever heard of the surf at Madras. It breaks on the beach with such fury that no ship's boat can venture through it. The only conveyance in which people can land with safety is a road boat made and guided by the natives. It is a large, clumsy barge-like looking thing, made of rough planks stitched together, and so elastic that it readily yields to the pressure of the waves. A boat of this sort was sent off for us, and a dozen half-naked blacks, howling all the way the most dissonant song that you ever heard, rowed us with great skill to the shore...."
The boat which Macaulay writes about would most likely have been the 'masula boat', but even in those times, catamarans (from 'kattu-maram', meaning 'logs tied together') such as the ones in the photo would have been very much in use. Though motor boats and mechanized trawlers are preferred by many fisherfolk today, those who operate on a smaller scale continue to use these catamarans - of course you can see these boat bringing in the catch of the morning, a commonplace sight every day. It is not easy to imagine what Macaulay meant when he writes about the fury of the surf at Madras; the hundreds who come to the Marina would imagine it is a different Madras. A different Madras indeed it was five years ago, when the tsunami of 2004 hit the city, taking with it over a hundred lives. The surf was indeed furious that morning - let's hope it does not happen again! Like many of Madras' roads, Boag Road was also named after a senior civil servant who had his official residence there. It is likely that it was the only house on the road, when it came up sometime in the early part of the 20th century. In any case, the road leading up to Sir George Townsend Boag's house came to be called Boag Road, and continued to be called that until almost at the end of the 20th century. Abode") - was it because he was also acting in a film of the same name during that time? In 1995, Sivaji Ganesan was awarded the title of Chevalier of the Légion d'Honneur; in 1998, South Boag Road (Theyagaraya Road had cut across Boag Road by then) was renamed 'Chevalier Sivaji Ganesan Salai'. Though the actor moved on to a higher stage in 2001, the house continues to be occupied by his sons, who consider it a memorial to their father. Surely, Sivaji's name will live on in the road much longer than that of Sir G T Boag! The idea was to get disabled-friendly, I guess. A ramp leading to an elevator which goes up to the overhead road crossing will certainly help senior citizens and those on wheel chairs to get across to the other side. The shutters are still locked up, waiting for a formal inauguration. Would they open to allow everyone in? Or is there someone going to watch over the entrance and open it only for those who "really need" to use the elevator? Does anyone use this crossing at all? Actually the first person who used the new construction was someone who got on top of it last week and threatened to jump off - luckily the Fire Service personnel got him before he leapt! It was in 1793 that the "citizens of Madras", as represented by the Council in Madras, sent a letter to the President of the Royal Academy in London, expressing a desire to memorialize the military achievements of General Charles, the 1st Marquess Cornwallis. During his tenure as the Governor General of India between 1786 and 1793, Lord Cornwallis defeated Tipu Sultan in the 3rd Anglo-Mysore War. That was the crowning glory of his military career; a career that might have been consigned to the ashes when he surrendered to George Washington and Comte de Rochambeau after the siege of Yorktown in 1781. Luckily for him, King George III was favourably disposed to him and instead of being left in the cold, he was sent to India as the Governor General, where he redeemed himself in no small way. And so the request from the Council at Madras, that the Royal Academy send them a statue executed under the "inspection of the Academy". The Academy assigned the task to Thomas Banks; the final sculpture, 14.5 feet tall, showing Cornwallis in all his lordly mien, standing upon a pedestal reached Madras sometime in 1800. One account has it that the statue was erected in Fort St George, while another says its first home was under a cupola at the junction of Mount Road and (today's) Cenotaph Road. That's a fine point, but the statue did spend time at that junction, which was when Cenotaph Road got its name. The pedestal shows Tipu Sultan giving up his two sons as hostages, to be held until Tipu was able to pay the multi-million pound indemnity to win them back. Many thought this particular depiction was in poor taste (compounded by poor execution - the work on the base of the statue suffers greatly in comparison with the detailing of his Lordship) and that was probably one reason why the statue was moved to the Fort in 1906, overlooking the Parade Ground. In 1925, it was moved to the gates of Bentinck's Building, the then collectorate of Madras. That location was too close to the sea and the salt air did not agree with his Lordship. In 1928, he was moved to the Connemara Library and then, in 1950, he was moved to the newly purposed Fort Museum - and here, he only has room under the stairs! A while ago, I'd written about the waning-but-still-there desire to buy fresh vegetables as directly as possible from the farm. Seeing this lady at Zam Bazar, I was reminded that it is not just the vegetables, but also meat which is sought fresh. There are several people who do not want to go anywhere near a cold storage, but prefer to get their meat fresh. It is not like the 'wet markets' of Hong Kong or Singapore, but with no blood being spilled here, it doesn't need to be washed. But you'd better watch out for all the dust! That's what it is, the River Cooum turing due east as it heads out to the Bay of Bengal, marking the end of its 65-km run. During the past few days, there has been some renewed interest in the project to beautify Cooum, what with the Deputy Chief Minister reiterating the government's committment to not only beautify, but also restore the river to its glory days. 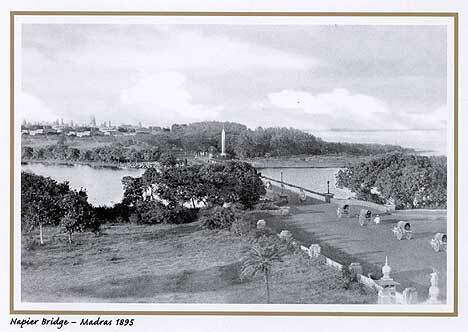 In those glory days, boating was quite common on the Cooum. Although there have been no boats for quite a long while now, skeletons of the boat houses are still around - you can see one on the right, just over the wall. It is rather surprising to see them standing even today! I don't think there is any other court of justice of which it can be literally said that it cast its beacon of light nearly 35 kilometres around. That honour can only go to the High Court of Judicature at Madras - that is because its tallest minaret, at about 175 feet, was taller than any other structure nearby when the court buildings were opened in 1892. Although I haven't been able to find anything to support it, my guess is that the minaret was designed to play the role of a lighthouse. It holds the record for being Madras' longest serving lighthouse, having been used for about 83 years, from 1894 to 1977. The first lighthouse at Madras became operational in 1796 and was little more than a lantern with reflectors, housing a dozen coconut-oil burning lamps, placed on top of the Exchange Building (the Fort Museum of today). It was used for almost 50 years, when it was moved to the Esplanade, atop a Doric column built for the specific purpose of serving as a lighthouse. That column, which came into use in 1841, still stands inside the High Court complex, having given up its crown to be housed in the minaret of the Court. The Argand Lamps and reflectors, which began flashing on January 1, 1844, was supplied by Chance Bros., Birmingham and was replaced - rather, improved upon - in 1927 and by all accounts continued to be used until 1977. So which is Madras' fourth lighthouse? All of you from Chennai would have seen it at the south end of the Marina, but that's subject for another post! The minaret may not look so tall from this perspective, but an older post shows it standing head and shoulders above its cousins! The first formal postal services - maybe it is better to call them the Company's first postal services - in Madras were fairly rudimentary, with a dak runner to carry the Bengal mail. Madras got its first Postmaster General only in 1774, which was also the time when the company mail began to carry, for a charge, private letters also. Over the next few years, the public was likely fleeced with erratic charges for their private letters - and they were subsidising the expense incurred by the government, for all letters of Company employees were carried free. Mr. John Philip Burlton, a "junior civilian of eight years' standing" (now, what does that mean?) first wrote to Lord Macartney and then to the acting Governor of Madras, Alexander Davidson, in 1785, with a proposal to "establish a regular Tapall or Dauk upon a Plan similar to that at Bengal". It found favour with the authorities after a few rounds of consultations with civil servants of Bengal. Meanwhile, Governor Davidson was succeeded by Sir Archibald Campbell - he wanted his private secretary A.M. Campbell to be in charge of the Post Office, with Robert Mitford as his deputy. That was not acceptable to the Company headquarters, since neither were Company employees; they favoured Burlton as the chief of the Post Office. As often happens, a compromise was struck and on June 1, 1786, the General Post Office opened near the Sea Gate of Fort St George with Mr. Richard Legge Willis as its chief. For the next 70 years, the GPO worked within the Fort. It was only in 1856 that it moved out to Garden House, in Popham's Broadway. Nearly 30 years later, in 1884, it moved to this building on North Beach Road (now Rajaji Salai). The architect was Robert Fellowes Chisholm, who incorporated elements from Travancore, Bijapur and Gujarati architecture to come up with this building, which continues to be Chennai's General Post Office today. Though a fire in 2003 ravaged the rear of this building, the facade still stands as a striking example of Indo-Saracenic architecture! One of the hangovers of the Madras Presidency days is that many people in the northern parts of India consider anything 'south of the Vindhyas' as being "Madrasi". And that was the explanation given to me by the shopkeeper at Dilli Haat when I asked him why this product was called 'Madrasi Saunf': "ye toh south mein log bahut khaate hain" - people in the south eat this a lot! It is quite characterless today, but 'Victory House' is a building that has seen a lot of action going on around it since the late 19th century. It was originally built for Whiteaway, Laidlaw & Co., a Calcutta firm (here's a picture of their headquarters) which had branches not only in India/Pakistan but also in Ceylon, Burma and the Malay Settlements. It is not known what the building was called when it was built for Whiteaway, Laidlaw & Co., but one story has it that after the Allied powers prevailed in the First World War, Whiteaway (or equally likely, Laidlaw), in a fit of pride, named the Madras branch 'Victory House'. Though the firm was quite successful in its other locations, it could never overtake the Spencer's of Madras and post-independence, found its clientele further dwindling. The building was then bought by C.R.Srinivasan of the Swadesamitran for the newspaper's offices - their presses were in Royapettah, but perhaps Srinivasan was carried away by the symbolism: taking over 'Victory House' from its British owners reflecting the success of the newspaper's strident calls for 'self-rule'. Maybe he named it 'Victory House' after he bought it, celebrating that success. In any case, the newspaper itself fell away and was almost bankrupt by the mid-1970s. It was sometime around then that The Swadesamitran Ltd began asking its tenants to move out of the Victory House, claiming that the century-old structure was unsafe for occupation. One of the tenants, who was paying a monthly rent of Rs.7,000/-, offered to buy the 10-ground property for Rs.20 lakhs. The situation became messy, with Swadesamitran going to court for an eviction and the tenant filing a counter-case arguing that Swadesamitran was backing out on their deal merely to raise the price. While I do not know the details of the arguments, or even the final judgement, it is easy to assume that the tenant won the case. Over the years since, that former tenant - VGP & Co. - has converted the entire building into one huge stockpile of consumer electronics and durables. Victory House has lost its earlier charm (you can see the earlier building in this picture, on the right) and has become one more nondescript structure on Mount Road! In their earlier avatar, Harrison's Hotel did not find any need to advertise their age. When you turned your vehicle into their tree-shaded front yard, you knew that this was an institution with a lot of years behind it. The low round cane tables with their red-and-white-checked tableclothes, circled by cane chairs, out on the verandah of their bar - or was it the restaurant? - proclaimed the elegance of an era that was long-gone even in during the 1980s. Once there, you were transported to some plantation far away from the city. Sadly, even the cuisine was modelled on the spartan aspect of the plantations, so it was truly a 'throwback' place. No wonder that it was losing out on its clientele in the beginning of the 21st century. So, away went the front yard, and the two-storied structure. In its place came the swank new boutique hotel - Harrisons. Even now there is some debate about what it was called in its pre-renovation days: was it Harrisons, or Meenam (which is one of the restaurants in the new hotel), Queens or O'Papa? All four names seem to have been in use earlier, but today it is unequivocally Harrisons, with the words 'Since 1885' under it. There does not seem to be any document going all the way back to the 19th century, though. In the lobby of the Harrisons, there is this framed letter dated March 10, 1914, from the then Governor of Madras, Lord Pentland, appointing "Messrs Harrison & Co., to be Caterers and Confectioners in ordinary to His Excellency...". In the new-age lobby, few people bother to even glance at this relic. Those who do might wonder what this has to do with the current avatar - the cursory caption does not really capture the heritage of the institution! It was said this flyover would be ready in a year's time. It has now been fifteen months since work began on this, the latest Chennai 'high-rise' and it looks good enough to drive on. Problem is, the approach and side roads at both ends of the Cenotaph Road - Turnbulls Road flyover are in a state of complete mess, so it doesn't look like the flyover is going to be put to use just yet. That's good news for a few of the kids from around the place. They have been using the nice, flat surface of the road as a cricket pitch over the past couple of weekends - at least there's some kind of 'driving' going on there! The vada is supposed to be one of the oldest dishes from this part of the world, but it must have been a truly inspired moment when a foodie decided to soak, rather than just dip, her vada in the sambar. There are few places better than Rathna Cafe in Triplicane where the sambar vada can be enjoyed in all its glory. They even leave behind a long-handled sambar pan (design patent pending, I'm sure) so that one isn't embarassed by having to ask for repeat servings of the sambar. Enough said. The tongue drools! From the air, it looks like a half-open switchblade knife, with a smaller appendage following the main blade. Located inside the Taramani campus of the University of Madras, the National Centre for Ultra-Fast Processes appears more like a bureaucratic office than the high-tech research facility it is. The only one of its kind in the country, the NCUFP was set up to help researchers understand what happens in structures - physical, chemical or biological - during certain processes which take place in infinestimally small slices of time. The mind boggles so much at the mere description of such time-slices: nano-, pico- and femto-seconds, the last named being equal to 1 X 10^-15 of a second, that it is unable to imagine anything which can happen within that time. Apparently a lot of things do happen, enough to keep 4 full-time faculty members (and 2 Emeritus Professors in addition) busy guiding the 15 or so students doing their doctoral research in - well, some highly specialized areas. Typically, their research is around chemical processes, which usually take a few hundred femtoseconds to be completed. The femtosecond, however is not the smallest unit of time that has been observed until now; that distinction goes to the attosecond, which is 1 X 10^-18 of a second (or a thousandth of a femtosecond). But even the attosecond is not the theoretical smallest unit of time. For the theoretical scientist, that would be Planck Time, which is the time taken for light in a vacuum to travel one unit of Planck Length (the smallest distance about which anything can be known, theoretically); the equivalent of 5.39 X 10^-44 seconds. You certainly need more than just sharp eyes to spot the action at that speed - and here's Chennai using those eyes for all of us, all over the world! Well, not exactly. The Major Band is on the move, getting ready for their next gig from the top of their vehicle, which also serves as their stage. St Mary's Church, inside Fort St George, is packed with memorials to British officers long gone. In almost all cases, the inscriptions on their memorials are lengthy enough to provide several clues to the officer's career and accomplishments. One of the few exceptions to this rule is this statue on whose pedestal it just says, "Conway - Adjutant General - Obiit 13th May 1837 / Erected by the Army and by the Public". That's most probably because there was quite simply too much to say about Thomas Henry Somerset Conway, who had served in India, "having never quitted the country", for the entire duration of his 44 years' service with the army. It is also likely that he spent a vast majority of those years in Madras. A story tells of him, then a young Ensign beginning his career, looking out through a window of the Exchange House in Fort St George when he was tricked into believing that the House was on fire. Upon which Conway jumped out of the window and broke his leg, no doubt providing a lot of merriment to his brother Ensigns. From those early days in Madras, he went on to become the Adjutant General of Madras, a position he held for 28 years, under eight Commanders-in-Chief. During his service he covered almost every military campaign in south India, apart from seeing action in the Mahrattah War and serving on the Military Finance Committee at Calcutta. Unlucky with promotions, he remained a rung lower than his contemporaries, a circumstance that some attributed to his unrelenting discipline and rigid integrity (it is said that he died without leaving behind a shilling - for a British officer in early 19th century Madras, that's saying something!). Those qualities also gave him an unmatched understanding of "every thing relating to the dress, drill, appearance and discipline of an army". Technically, he was the Brigadier at Hyderabad when he died. However, he hadn't yet formally assumed that post, for he died of cholera at Guntoor, en route to taking charge at Hyderabad; which is why this statue (by Turnouth) credits him as Adjutant General. Though he was absolutely strict as a disciplinarian, unwilling to distingush the human from the organization, he was held in high regard by the men who were under his command - and that's why, in small letters, right on top of the pedestal, it says "The Soldiers' Friend"! The National AIDS Control Organization (NACO) has installed 11,025 Condom Vending Machines (CVM) across all metros and major cities in order to "provide anytime access to quality condoms in a non-embarrassing situation". By that objective, the CVMs have to be placed discreetly and therefore lack the in-your-face subtlety of the family planning advertisements of the 1970s. Those advertisements could be seen everywhere - especially along the walls of houses and barns in the 'mofussil' areas. Showing a husband, wife and two children and the slogan "We two, ours two" (or local variants thereof), the ads would also have a large inverted red triangle. That triangle went on to become the generic logo of family planning programmes not just in India but also in several other countries. The man who is credited with coming up with that logo, Dharmendra Kumar (Deep) Tyagi, died childless at 41, before he could see the amazing recall his design provided the programmes. But his memory lives on in the name of one of the largest organizations providing subsidized condoms to many parts of the world - DKT International, founded in 1989 by Phil Harvey, who had worked with Deep Tyagi in the 1960s. DKT International today is a key supplier to NACO; apart from the condoms, DKT International also provides support on distribution of contraceptive products, and for various community sensitising programmes across the country. Somehow, they seem to have got one thing wrong: red may have been the right colour for the inverted triangle, but when you want people to use something, shouldn't you be choosing a colour that invites them to go ahead? I must have been in the 7th standard or so when I first noticed this building and that was because I had just learnt that 'amalgam' was a compound of mercury. Ever since, I've looked out for this sign whenever I am on this stretch of Mount Road; I don't think the sign has changed from my first sighting of it many, many years ago! Maybe it hasn't changed ever since the company was formed sometime in the late 1930s. Sir Alexander MacDougall and W.W.Ladden, the then Chairman and Managing Director respectively of Simpson & Co., decided that Simpson's be controlled by a holding company and hence set up Amalgamations. Also with them as the only other shareholder/Directors of Amalgamations were P.Reid and S.Anantharamakrishnan; the latter, referred to as "J", was possibly the only 'native' Director of Simpson & Co. until then. Over the years, many other companies were formed or were brought into the Amalgamations fold. Today, there are almost 40 companies in the Group, spanning all kinds of businesses from tea to tractors, but mainly around automobile and auto-component businesses. In the 70-odd years that it has been around, the Amalgamations Group has never sought to build a brand for itself. Like most of the companies in the Group - actually, like many a Chennai-headquartered company - it has been a silent achiever over the decades! You'd expect a gate to the Southern Railway's headquarters building to have some indication about the building. There is nothing in all the iron-work on this gate which directly refers to the Southern Railways. But look closely and on the top right corner of the gate, you can make out the intertwined letters "MSMR". That's what the building was originally meant for, the Madras and Southern Mahratta Railways. Though the MSMR is no more (it was merged with the South Indian Railways and Mysore State Railways to form the Southern Railways in 1951), the letters still live on here. Now, isn't this a gate that has stood the test of time! You'd probably not notice this building if you're going up Bharathi Salai (Pycrofts Road) on your vehicle, but there's no way you can miss seeing it if you are on foot. It is not the oldest building around, but there's a certain art-deco kind of feel to it, so you want to stop and stare at it a bit. It is definitely worth a stare; apart from the reliefs of Lakshmi (on the left) and Saraswati (on the right), there is a headless figure of Lord Subramanian between them. Topping them all is a bust of Mahatma Gandhi, placed on a globe showing the Indian subcontinent. Each floor seems to have a name of its own; starting with "Siva Mani" on the ground floor, we move up through "Sri Rama Nilayam" and "Swami's Summit", before reaching the penthouse (if it can be called that), which is named "Gandhi Peak". The house was built sometime in the early 1920s by SP Ayyaswami Mudaliar, a civil engineer who was also an active member of the Indian National Congress. Maybe he had ideas of turning the whole building over to the Congress, because there is a plaque saying "Donor Engineer S.P.Aiyaswami" somewhere on the facade. He didn't do any such thing, however, for his descendents continue to stay in this building, adding to the multitude of signs indicating the many purposes the building has been used for - "Sundaralaya 1926" says one, "Sivaraja Bhavanam 1926", says another; a third says "Professor S.P.Singaravelu Institute". A much newer sign says "S.P.Dhananjaya 149 Bharathi Salai". But the newest of them all is a plaque on the gate-post, one that does not appear in this picture, which celebrates the 5 days that Netaji Subhas Chandra Bose stayed in this building, over two visits, in September 1939 and January 1940. Maybe it was between those visits that Netaji firmed up his strategy of aligning with the Axis powers! The National Geographic magazine calls it "...probably the only successful example of the sustainable use of a wild species in India.". The Irula Snake Catchers Industrial Cooperative Society (ISCICS), which is thus described, has been around since 1978, but I first got to know about them in the early 1990s, when a friend working with an NGO contracted the ISCICS to catch rats that had become a menace in the Madras Central station. The Irula tribe gets its name from the Tamizh word 'irul', meaning darkness. It is not important whether the word signified their complexion (they are supposedly descended from Negrito stock) or the timing of their chief occupation, for they would be active during nights, hunting rats and snakes. The latter catered to the demand of the global skin trade, ending up as shoes or bags with high fashion labels. The tribespeople were famed for their ability to track and catch any snake, especially the poisonous king cobras and the Russell's vipers, which were numerous in the regions around Madras. It is estimated that the entire population of the Irula tribe - about 250,000 people today - has always been concentrated around Chennai, and was entirely dependent on catching and skinning snakes to make a living. The Wildlife Protection Act of 1972, while being a boon in general, struck a body blow to the Irulas' livelihood by making it illegal to hunt wild animals. And then in 1976, export of snake skins was banned under the Act. Many Irulas were forced to turn to other occupations, which they promptly made a hash of. Even after a couple of generations, the Irulas are uncomfortable in the mainstream, though a majority of them are now part of it. A small group, however, formed the ISCICS in 1978 under the guidance of Romulus Whitaker, the man behind the Madras Snake Park and the Madras Crocodile Bank Trust. The ISCICS members (about 500 of them now) continue to catch snakes, especially poisonous ones. But there is a difference; they catch them live, tag them, house them for about a month, during which time they are milked for their venom once a week. At the end of the month, the snake is released in the wild and they are not brought in again for at least 3 months. The members of the ISCICS have been scrupulously following the processes for capturing, milking and releasing the snakes. They also have some space within the Crocodile Bank for demonstrating the venom milking and to speak about the snake species around Chennai. With all these efforts, they earn enough to live with the modern-day norms without sacrificing their ancestral skills - now, how's that for sustainability! The State Flower of Tamil Nadu is indeed a rather unique specimen. The young flower of the Glory Lily (Gloriosa superba) starts off with its mostly-flat green petals drooping downwards. As the flower grows, not only do the petals lengthen out, but they also begin to get all crinkly and move from their droopishness to curve backwards. In the process, they also change colour from green to red, passing through a stage of partial, if not complete yellow. As the petals curve back, the stamens of the flower follow them part-way, and in the mature flower, appear like outriggers stabilising the flower. The flower has medicinal properties. Which also means that it is poisonous, if the dosage is exceeded or otherwise improperly administered. Seeing some of us carrying this flower with us, the locals ran up to ask us to drop the flower and to make sure we washed our hands well: it is indeed that poisonous, they insisted. Though it is the root that is the most poisonous (most medicinal), the leaves and the flower can also cause acute discomfort all along the digestive system, so why take a chance? Because of its medicinal value, the plant is apparently becoming scarce. I don't think it is very easy to spot one in Chennai. In fact, I saw this one in the Thattekad forest in Kerala! Rather, action has been on a few other fronts. Have slipped out of the 'Daily' habit on this blog, but you have my word that it is only for a short while. Regular service will resume on November 11, 2009, God willing. Good habits should not be broken, so please do keep visiting, and keep those comments coming! I have no idea what this is here for. It does not appear to have been properly finished, either. An 1895 picture of the Napier Bridge shows an obelisk at the north-eastern end of the bridge, but that looks like a pretty much completed structure. Maybe it was knocked down at some point, and an apology of a replacement was made. But why am I thinking obelisks today? There is no connection between those indomitable Gauls who turn 50 today and the city of Chennai, save for the three years that Madras was under French rule. Yet, on behalf of all the Asterix / Obelix fans of Chennai, Bon Anniversaire! It is the end of October and the rains aren't here yet. Worse, the heat remains terrible. Iced drinks continue to do brisk business. Though there are all kinds of refrigeration equipment and cold storage options available these days, the demand for readymade-ice continues to hold steady. This person, delivering a 5-kg block to a fruit juice centre is part of a reasonably big industry which is mostly ignored by the general public. The city's demand for 'block-ice' is large enough to sustain several ice factories; the exact number can only be a matter of conjecture, for there are many run clandestinely, providing smaller sizes than the industrial norms of 50-kg and 140-kg blocks. What we see on the streets are obviously far smaller, with a 50-kg block probably taking care of the needs of about 10 to 20 'juice centres'. These blocks typically come from the factories of south Chennai, for they are the ones catering to demand from hotels, clubs, hospitals and the like. The ice factories of north Chennai on the other hand deal almost exclusively with the fishing industry: both seagoing and land-based. Boats that go out to sea carry on them 5 tonnes of ice for a week-long trip; the chilling plants on shore need large volumes of ice while they process the daily catch. By one estimate, the city consumes over 100 tonnes of 'industrial ice' every month. Wonder where they will get all the water they need, if the rains continue to stay away! Where the character came from is not really known, but given the Madrasi's penchant for alliteration, Jaambajaar Jaggu is more likely a legendary figment of imagination. I'm not sure if kids these days have any local personification of a bumbling villain, but Jaggu was it for quite a lot of people from the '60s through to the '80s. The first time he came on the scene was probably in the movie "Bommalattam", with Manorama singing "Vaa vadhiyare vootande / nee varankatti naan vidamatten / Jaambajjaa Jaggu / naan Saidapettai kokku" to Cho Ramaswamy (here's the song from the movie). Then came Cho's stage play "Madras by Night". Cho makes his entrance asking the question "Jaambajaar Jaggu theriyuma unakku, Jaambajaar Jaggu?" ("Do you know Jaambajaar Jaggu?"). Cho plays a police constable in Madras of the '60s, forever dropping names of rowdies that he has encountered (here's a clip: Jaggu's name drops in the 2nd minute). With that, the name took off and though no one has ever seen him to this day, Jaggu continues to be a menace-laden character, appearing most recently as the villain in the children's book "Trash", published in 2001. So, when I see the Zambazar Police Station, it is difficult for me to think of anything else but a police constable in the '60s, wearing starched khaki shorts ("...with pockets large enough to hide a monkey", as a school teacher once said), trying to show off - no matter that Zam Bazar has much more than Jaggu to offer us! Quite close to the 'old townhouses' of Mylapore is this building, which is actually quite distinct from the structures around it. It must have been a twin house at sometime, with one side being quite the mirror image of the other. Interestingly, both sides have space for commercial activity, though my guess is that those were originally meant to be enclosed car-parking spaces. All other things being equal, the shops provide the distinction between the two residences. On the right is Joseph Store, a general store offering all kinds of provisions; on the left is Sri Vinayaka Auto Works. Maybe the residents thought this differentiation wasn't good enough, so they painted their portions - including the grills and bannisters - in different colours! By me, that is. A visit to Adyar Poonga yesterday added two more butterflies to my list. This is one of them - the Lime Butterfly (Papilio demoleus). Although it is described as the most common of the 'Swallowtail' butterflies, I am fairly sure there weren't too many of these in Chennai until a few days, maybe a few weeks, ago. And then, suddenly, they seemed to be everywhere around. One explanation is that they are migrating from the hills to the plains. Maybe they are moving to avoid the cold, maybe to find food. The movements of butterflies seem to be more mysterious than those of birds and much more difficult to study. Yet, almost anyone in Chennai with even a casual interest in nature would have (and several have, indeed) observed the more-than-usual number of butterflies this season. In some places - by the Thiru Vi Ka bridge, for instance - the air is thick with these and other butterflies; birds swoop and swerve, trying to catch them. If more motorists were nature enthusiasts, traffic on the bridge would have come to a standstill! Inside Chennai Central. As the passengers wait for their rake to come in, the 'licenced porter' uses the break to take a quick nap in the aisle. Everyone will burst into action the moment a coach is sighted in the distance! After having all the hoardings on Chennai's streets removed, the next step for the Corporation of Chennai was to clear posters and graffiti from all the public walls in Chennai. Though the hoardings came down more than 18 months ago, there was a long gap before the next step was implemented (guess the elections had something to do with it). Effective August 1 of this year, all random art and pastings on flyover and subway walls have been banned. The ban also extends to any public walls on Mount Road. Bringing the hoardings down signalled the end of the huge, originally hand-painted but recently digitally-crafted cinema advertisements which were very much part of Chennai. And now, the bare walls would take away another slice of kitschy art: political graffiti. The limited set of colours used by earlier political artists (colours of the parties flags) had given way to bright, multicoloured works a while ago. It was felt that bare walls would make the stretch of road seem dull, so the Corporation kind of let loose a set of artists on those walls. The first stretch to be done was a stretch near the YMCA, Nandanam. With a variety of themes - buildings and structures of Tamil Nadu, sculptures and cultural heritage being a few - and a good dose of imaginary imagery thrown in, the paintings seem rather unconnected, if one spends the time to look at them. But for the most part, one is whizzing by in a hurry to get someplace and the overall effect is that a riot of colour is passing one by! Maybe that's a shop in the building at the end of the road, with its wooden doors still shut below an awning which appears to be falling under the weight of the previous night's rain. Mundagakanni Amman Koil Street, from where this photo was taken, veers off to the right; the spur on the left is Nattu Subbarayan Street. This is in Mylapore, very much part of Old Madras and yet, quite different from the streets of George Town. Indeed, these areas were populated much before George Town was. Predominantly revolving around religious activity, these bustle on these streets had God, rather than Mammon, in mind. These are streets where a new face is spotted quickly, and the residents wonder what the stranger is doing, walking their paths. Of course, they are not all that insular, what with many vehicles trying to take a quicker route to their destination through these back roads. But the pedestrian still invites curious glances. Many of the buildings are over half-a-century old, but several have been refurbished and expanded to keep pace with modern day requirements. The building on the corner, however, seems to be just the way it always was! This defunct fountain in front of the Victoria Public Hall proclaims the city's gratitude to a former governor not once but three times, going by the plaques on each of the three faces of the centrepiece. Sir Charles Edward Trevelyan, who is so honoured, was the Governor of Madras for just a short while, from March 1859 to May 1860. Even in that short stint, he did enough for him to be held dear by the citizens of Madras. For starters, he made land ownership easier, bringing in reforms that allowed freehold titles to be bought. He is also credited with conceptualizing the People's Park; a 116-acre garden spread which had over 5 miles of road inside it, meandering around 11 ponds, a bandstand, tennis courts, a public bath and a very basic zoo. It is for this that he is remembered: the plaques say "...to whom Madras is indebted for The Peoples Park". But there's a lot more that Trevelyan needs to be remembered for. When he was governor of Madras, his council and he disagreed with a proposal for taxation drawn up by the Financial Member of the Legislative Council for India. And he made his disagreement public, by sending an open telegram to Calcutta and later, by releasing (or allowing the release of) the minutes of a Council meeting where the opposition was recorded. Though he was censured and recalled to England for this action, he was vindicated and returned to India in 1862 as the Financial Member! In the interim, he crafted the principles which guided the creation of the Indian Civil Service. With so much to his credit, one guesses that the city's gratitude stemmed from something more than Trevelyan's civic sensibility! A long time ago, one would look down into the forecourt of the Hotel Arun, when passing it on Poonamallee High Road. The first thing that the developers did after taking over the property was to raise it up to the road level. During the process, they also blocked part of the Cooum's bed; an act that sparked off some tensions and delayed progress on the mall they were developing. It has now been almost a month since the first phase of the Ampa Skywalk has been opened; after nearly 4 years of waiting, folks are probably waiting for all the shops, the multiplex screens and the food court to come up before passing judgement on whether this is good enough to be a hip hangout. Big attraction - a walkway inside the mall, 80 feet above ground, which you will have to cross to watch movies at the PVR Cinemas (which I believe are yet to open). It hasn't yet become so popular as to cause traffic pile-ups. Or did I pass by at the wrong time of the day? At its northern end, just after the MGR and the Anna Memorials, the mouth of the Cooum marks the 'public' limit of the Marina Beach. Not that the public flock to see the river meeting the Bay of Bengal. It is rather dull, but that is only to be expected. The Cooum, at the end of its 65 km run, is weighed down by all the muck that has been poured into it (mostly along its last 16 km within Chennai city) and is barely moving along, more sludge than water. For maybe just a couple of days in the year, the waters of the Cooum would be racing to the Bay of Bengal. That happens when (and if) the storm water drains do their job during the monsoons. There are 16 canals which collect the runoff from those drains and pour it into the Cooum (and to the other waterways of Chennai - the Adayar River and the Otteri Nullah), en route to the Bay of Bengal. Works well in theory; but with Chennai being quite a flat city, any blockage of the drains will cause the city to flood up. One of the largest potential blockage points has been the silting - and sedimenting - of the Cooum's mouth. Though it is sometimes cleared up during the monsoon by the sea, most of the time, the waves deposit sediments which clog up the mouth. October is normally the month when the authorities clear up the mouth - and other passages. Let's hope they do it well enough for us to have a flood-less monsoon! And the crackers burst on! It was most likely the scene in every street this morning: a few indefatigable souls making sure that no one forgets it is the morning after Deepavali. As the years go by, the number of such souls seems to be going down. Time was when Deepavali was a morning event in Chennai; kids would leap out of bed at some unearthly, dark hour of the morning and try to find that thin line between taking long enough over the ganga snanam to satisfy the elders, without taking so much time that the neighbouring children become the first to set off the crackers. By some near-divine coordination, almost every household would be ready for the fire-crackers at around the same time, and folks would greet each other with "Yenna, sir, ganga snanam aacha? Happy Deepavali!". But the sound of the crackers has become politically incorrect. The lights of the fireworks have become more attractive. Deepavali seems to have become more of an evening festival, at least publicly. I'm sure there are enough households that continue to keep the ganga snanam tradition going, even if slightly more privately than before! The harmonium is so closely identified with both Carnatic and Hindustani music that it is difficult to believe it is an import, coming to India in the mid-19th century via Christian missionaries. Somewhere in the early 20th century, it was seen as an instrument of colonialism and there were some attempts to stop Indian musicians using it in their performances. Because of its utilitarian nature, the harmonium survived those attempts. Probably getting the whole issue confused, John Foulds, who was head of the Indian Broadcasting Company (All India Radio's predecessor)'s Western music section in the 1930s wrote that since the harmonium is incapable of producing microtones and because it cannot be adjusted mid-performance, it is inappropriate for Indian music. A few years later, Lionel Felden, Controller of Broadcasting for the IBC banned the harmonium from the IBC's studios in March 1940. It was only in 1971 that the ban was repealed, but the harmonium player continues to be accorded a secondary status - solo performances are not allowed on AIR even today, apparently. But no musician can do without one. Even in this age of the 'electronic sruti box', harmonium makers like Kannan here continue to hand-craft instruments for students and maestros! The locomotive at the southern end of this building looks much bigger than its counterpart at the other end. However, this one does not seem to have the rambling history of the other one and seems to have served on just one sector, running between Bangalore and Bangarpet for all the 25 years it was in service. The Bangarpet-Bangalore line was put in place, in stages, by the Maharaja of Mysore as far back as 1918. Yelahanka, 16 km from Bangalore was at that time the homing shed for the locomotives working on this line. This ZP-4 locomotive, manufactured by the Nippon Sharyo Seizo Kaisha in 1950 entered service on the Bangarpet-Bangalore line only in 1955. In 1980, the Bangalore-Yelahanka line was dismantled for gauge conversion. With that, this locomotive saw the end of its service and it was brought over to Madras, to be plinthed in front of the Southern Railway headquarters. For as long as I can remember, this reptile has been in this enclosure, the Pen No.11 of the Madras Crocodile Bank Trust (MCBT). He apparently wasn't much when he was found on the grounds of the Central Leather Research Institute (CLRI); he only weighed in at around 15kg, as a 5-year old. That wasn't really much, for a salt water crocodile (Crocodylus porosus), a species that can reportedly grow up to 25 feet and weigh over a ton in the wild. In the 34 years since he was found at the CLRI, this croc has grown over 40-fold. Currently measuring close to 17 feet from the tip of his nose to the last scute of his tail, he weighs over 600 kg. And that, when he eats only twice a month, on the first and the third Sundays. The rest of the time, he mostly lazes around, showing off his figure to awed visitors. Some of them - the older ones, especially - find him too pacific to merit a name which had terrorized them on screen: Jaws. Jaws III, to be precise. But don't be fooled into thinking you can jump in and dance around in the pen. Jaws III is a mean chappie. Believed to be the biggest ever captive salt water crocodile, he has been giving folks at the MCBT a peculiar headache. They just haven't been able to find a female large enough for him to mate with. Two attempts in recent years met with horrific results: Jaws III just grabbed the little lady by her waist, tossed her into the air and chomped her down. Probably the keepers didn't realise what had happened, because they brought in another lady, who met with the same fate. The third attempt wasn't a complete disaster, for there was a mesh separating them. Business did not result, in any event. C. porosus live to a hundred, in the wild. In captivity, they can potentially live for longer. Jaws III still has time to find the love of his life. Know anyone? Rukmini Devi Arundale faced a great deal of opposition in her efforts to re-interpret Bharatanatyam; one of the arguments was that the dance form had become so bawdy, which is why it was rooted out from the very temples, where it was born. Rukmini Devi's intent was that the dance "...should create the temple atmosphere on stage...", as she searched for a design which would meet that intent. The result was the Koothambalam in the Kalakshetra complex. Designed and built with the help of D.Appukuttan Nair, who had also built the Koothambalam at Kerala Kalamandalm, the building can accommodate 750 - of which 50 will have to sit on the floor directly in front of the stage. The stage itself is raised only a foot-and-a-half from the rest of the floor, allowing the audience to clearly observe the footwork of the dancers. The building has walls of wooden slats, which allows the breeze to blow through, along with sounds from the outside. This is a view of the Koothambalam - also called the Bharata Kalakshetra Auditorium - from the rear. The front is graced by Rukmini Devi's statue - and her spirit certainly pervades every rafter of the Koothambalam! Went out for lunch last month to a new restaurant just across the road from where we stay. We walked, but my son insisted that he would cycle down. And yes, he did get his vehicle valet-parked! Somehow, this view of the Nungambakkam burial-and-cremation ground seemed rather serene. I seem to remember that whenever I looked out at this from the train, there was some smoke coming out of the chimney; this was the first time in a long while that the crematorium seemed to be at rest. This is one of the bruial grounds run by the Corporation of Chennai. Their website lists the other 34, as also 38 private ones. From what little I know about the procedures, the place where the death certificate is issued determines which one of the Corporation's grounds can be used. There is possibly no such restriction for the private ones, but many of them are denominational and therefore, well, private. There are 4 crematoria maintained by the Corporation which do not have any geographical restrictions; these are the electric crematoria at Anna Nagar, Kannamapet and Besant Nagar and the gasified one at Washermanpet. The draft Master Plan for Chennai's development had proposed to convert at least 20 of the existing crematoria to gasified ones. That will no doubt reduce the amount of firewood used for the purpose. It will also do away with the smoke from the chimneys - maybe this one has been modified already! What's a festival without some decorations? Sure, there are a whole lot of 'ready-made', re-usable stuff available, but they somehow lack the charm of the just-made thoranams. One is used to seeing them fashioned from mango leaves - they'd last for days, the slightly thick leaves changing from their dark green to brownish, just before they are replaced by a new bunch of the festoons. But for a change, here are thoranams made from tender leaves of the coconut palm - the kurutholai. The fronds are taken down before they are fully grown, so as to take full advantage of their flexibility. These are just one of the many designs that the kurutholai can be made into (here is another), but being tender, the festoons don't last for more than a day!